Atlanta-based podcast company HowStuffWorks has a few questions for you. 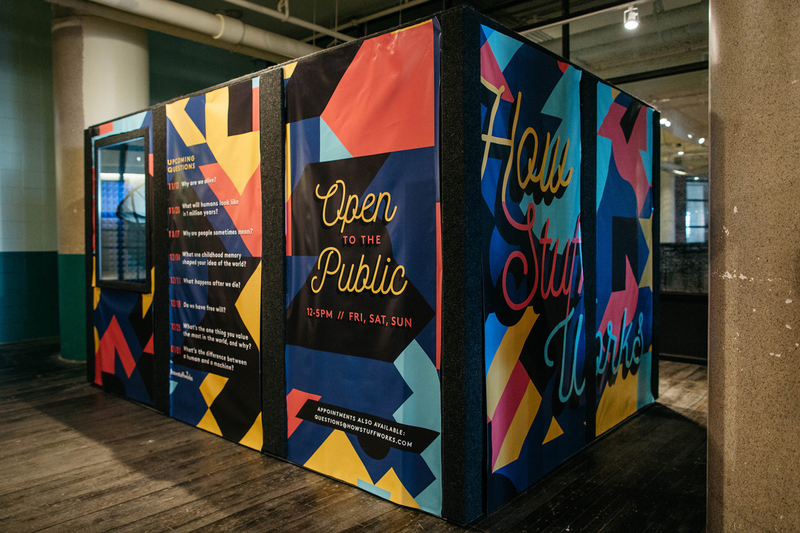 In an effort to learn the stories and opinions of Atlanta residents, the company—which produces the “Stuff You Should Know,” “Stuff You Missed in History Class,” and “Stuff Mom Never Told You” podcasts—has set up a small recording booth, called the Question Booth, at Ponce City Market where their headquarters is located. “A lot of what we’ve done is tell our own stories, but we thought it would be really cool to open up that door to our audience and start to capture other people’s stories,” says Conal Byrne, president of HowStuffWorks. For the next few months, the Question Booth will pose a different question every week to PCM shoppers and diners in hopes of gaining insight into some weighty queries: Is love a good thing? What’s your best memory? Why are we here? What happens after we die? Do we have free will? The booth, located in the Atlanta Gallery Collective on Ponce City Market’s second floor, is open from noon until 5 p.m. on Fridays, Saturdays, and Sundays. “The goal is to end up on the tail end of every week with dozens or hundreds of answers to the same question,” Byrne says. The booth is run by a HowStuffWorks audio producer who guides guests through the questions and leads a conversation with them about their responses. The questions are meant to be thought-provoking and touch on topics the company believes people might not ponder enough. “We wanted to, to the best of our ability, stump people and stop them in their tracks,” Byrne says. Based on the responses that they receive from the booth, HowStuffWorks will likely set up booths across the nation next year, and they plan to eventually use the responses to create a new podcast.